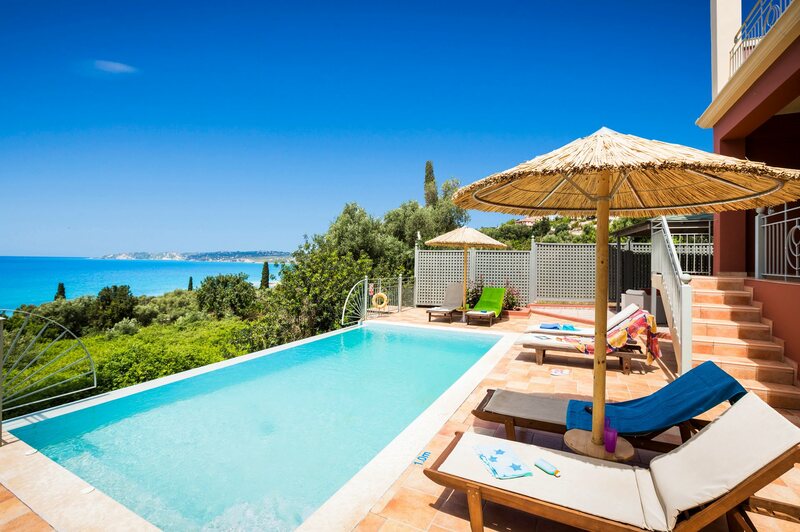 With spectacular views of the Ionian Sea, across to the island of Zante, Villa Andrea will not disappoint! This 3 bedroom detached villa has private balconies and a spacious pool terrace providing the perfect place to relax and watch the sun set. The property is within easy walking distance of Lourdas beach and the resort centre with a good choice of shops, restaurants and tavernas. Pool heating, air conditioning/heating in the bedrooms and WiFi is included. The position of this villa gives unforgettable views where you can admire the glorious sunsets Kefalonia is famous for - bliss! The infinity pool is surrounded by a tiled terrace on which sun loungers are positioned - perfect for relaxing with a good book. Around the side of the villa, there is a shaded alfresco dining area next to a brick BBQ. A comfortable, shaded seating area provides a sociable space to chill out in the evenings. There is a private gated driveway leading up to the villa entrance, with enough space for 2 cars. The front door is next to the driveway. Seven steps around the side of the villa lead to the pool terrace. There is an open plan lounge, dining and kitchen with comfortable sofas and a feature fireplace. Two sets of patio doors keep the interiors lit with natural light and lead out to the large shaded terrace with magnificent views over the pool terrace and the sea beyond and a table and chairs for a scenic breakfast. 7 steps from this balcony lead down to the pool terrace. A comfortable double and twin bedroom are on the first floor with access to a separate bathroom and patio doors to a shared balcony with sea views - what better place to watch the sunset with a glass of wine. On the ground floor there is a twin bedroom with patio doors opening out to the front of the villa with spectacular mountain views. All of the bedrooms are brightly decorated and have fitted wardrobes. Set on a hillside, on a residential road high above the coastline, Villa Andrea is just 10 minutes' downhill walk from the restaurants, bars and beach in the sought after resort of Lourdas. Lourdas is a laid-back resort, a great choice for a relaxing holiday as well as a good base from which to explore the southern part of the island, including the capital of Argostoli. Our Villa Leanda is just next door - perfect for larger groups wanting separate accommodation. Within a short walk is a bakery and a well-stocked mini market with beach supplies and a cash machine. The beachfront also has a couple of small local shops. There are no markets as such on the island but the nearby capital town of Argostoli has a large array of open fruit and vegetable stalls. You'll be spoilt for choice when it comes to places to eat. Lourdas has over 20 tavernas, most of which are along the beach front serving traditional Greek cuisine. The resort of Lourdas is mainly centred around its long sand and pebble beach, where sunbeds and umbrellas can be hired, as well as small boats and jet skis in the summer months. The small beach of Kanali, and shallow sandy bay with beachside taverna at Trapezaki, are both within 5 minutes' drive if you fancy a change of scenery. You can arrange kayak hire nearby, or why not venture along the coast to Skala which has a larger selection of water sports on offer? Boat hire is readily available in the area, or, if you're feeling adventurous, you can catch one of the daily cruises to the neighbouring islands of Ithaca or Zante! Mazarakata Tombs and the monasteries of Sission and St. Andreas, to name a few. Half an hours' drive inland will take you to the Gerasimos Monastery (named after the island's patron saint) and the Robola Winery are both worth seeing. Argostoli, 30 minutes' drive east, is a pleasant harbour with plenty of shops, bars and restaurants. Melissani Lake and Caves, and Myrtos Bay are 2 of the most popular attractions on the island, both within an hour's drive. There are also some great walking routes around the immediate area, both hilly and flat, which are a great way to see more of the island's stunning scenery. Villa Andrea is not available to book for season as it is sold out. Take a look here at the Kefalonia villas that are currently on sale. overall a brilliant holiday thank you !!! All excellent in everyway possible, from booking, through to getting to the villa and home again, EXCELLENT keep up the good work please!!! From the minute we booked the holiday to the minute we stepped off the plane back in England the whole experience was fantastic. We have been on many holidays in many countries, but we both agree this was up there as one of the top holidays we have had,we normally only book a weeks holiday at a time and have done for many years but we`d wished we had booked this one for 2 weeks. Please give yourselves a big pat on your backs, Well Done !! !